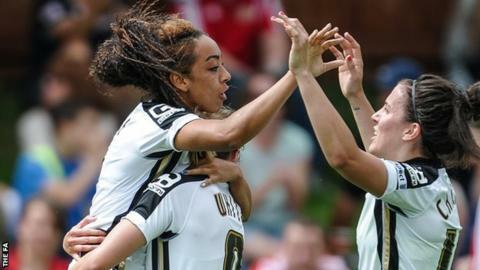 Notts County Ladies forward Jess Clarke says she has been spurred on by the disappointment of being left out of England's World Cup squad. Clarke, 26, who scored in Wednesday's 2-1 Continental Cup win over Birmingham City, has scored four goals in three games since the mid-season break. "As an athlete you have to take those knocks," she told BBC Radio Nottingham. "It is how you come back from it and learn from it. You just try be the best player you can be." Clarke, who has 49 caps for England, continued: "It is just about getting your head down and working hard for the club. "I feel like I'm regaining a bit more form now. Even though I'm scoring the goals it is down to the team - at times we are playing some really tidy football." Before Aileen Whelan headed home an injury-time winner for Notts at Meadow Lane on Wednesday, Clarke had scored all of the club's goals since the resumption of domestic action after the nine-week international break. Magpies manager Rick Passmoor is delighted with Clarke's response after failing to make it to Canada, where England finished third. "She is playing with a spring in her step, with a smile and is happy," Passmoor said. "In the last three games Clarke has been that bit of gold dust for us. "I'm really pleased for her because she needs to be knocking on that door again for England." Notts County's late win against Birmingham, after Remi Allen netted a second-half Blues equaliser, sees them sit second in Group Three behind Bristol Academy. Elsewhere, Sunderland won the opening match of Group Two, beating Women's Super League Two side Durham 2-1. Keira Ramshaw gave Sunderland a second-half lead before Sarah Wilson poked home to level for the hosts. However, a 91st-minute own goal from Anna Moorhouse, after Lady Black Cats striker Beth Mead got a touch on the ball from a corner, earned the top-tier side victory in the North East derby.